Siddharth's Enakkul Oruvan with Deepa Sannidhi opposite him is all set to hit the big screens worldwide on 6th of March. Actor Siddharth's most awaited Enakkul Oruvan will be releasing on March 6 and the makers have confirmed it through paper advertisements. Enakkul Oruvan is the remake of Kannada cult classic Lucia which is a science fiction with a lot underlying human emotions to it. 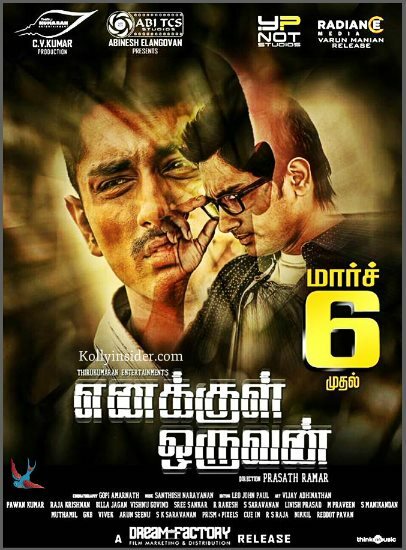 Excited Siddharth shared the news in his Twitter page: "#ENAKKULORUVAN releasing all over on March 6th. Really proud of this film.Excited to share it with the world! #March6", it read. Enakkul Oruvan will be jointly released by CV Kumar's Thirukumaran Entertainment, Abinesh Elangovan's Abi TCS, Sashikanth's Y Not Studios and Varun Manian's Radiance Media. The original director Prasad Ramar has made his Kollywood debut with Enakkul oruvan along with lead actress Deepa Sannidhi. It is worth a mention that the original Kannada version was produced by crowd funding technique while the Tamil version is released by powerful producers. Directed by Prasad Ramar, Enakkul Oruvan has Deepa Sannidhi, Srushti Dange, John Vijay, Aadukalam Naren, Yog Japee and many others to its star cast. Music by Santosh Narayanan, cinematography by Gopi Amarnath and editing is by Leo John Paul among the crew. Enakkul Oruvan has cleared censors long back with a clean U certificate and finally slated for March 6th release.